It&#39;s Equal Pay Day. Do You Know Where Your Paycheck Is? It's Equal Pay Day. Do You Know Where Your Paycheck Is? Good news, ladies! We’ve finally caught up! That is, if you consider working until this date to earn the average amount our white, non-Hispanic male peers did in 2018 “catching up.” And while according to 2016 data from the Pew Research Center, white women still out-earn most men of color, if you happen to be a black (August 22), Native American (September 23), or Latinx woman (November 20)—or any combination of the above—you’ve still got many months to go before you “catch up” with any of your white male contemporaries. If you’re an Asian woman, lucky you; at an estimated $.87 to each dollar earned by your white male peers, you may have an edge over the rest of us—but you’re still behind. In fact, with Asian men reportedly out-earning all ethnicities, you lag at a full 30% behind your male contemporaries of the same race—and that number is deceptive, since Pacific Islander women are actually some of the lowest paid of all ethnicities, according to research from the National Partnership for Women and Families (pdf). For those wondering, according to Pew’s research, black women earned approximately 8% less than black men in 2016. And interestingly, 2017 research published by The Atlantic indicates black women outpace white and Asian women in labor force participation, yet are also more likely to be fired. Additionally, as much as 80 percent of black mothers are the breadwinners of their households—so, you do the math. But aside from leveling the same very valid complaints year after year, what can we actually do to close the gender pay gap before the estimated 2o2 years the World Economic Forum estimates it’ll take at the current rate of progress? You can’t fix what you don’t know is broken, and the first step in advocating for equal pay is knowing if you’re being undervalued for the position you hold. Job site Glassdoor wants you to know your worth. You can use their salary calculator to get a free, personalized and private salary estimate, including strategies to help you ask for more. There’s power in numbers, and many of the strides we’re beginning to make are due to coordinated effort—just ask the women of Time’s Up, or the women of New York City’s CWA Local 1180. 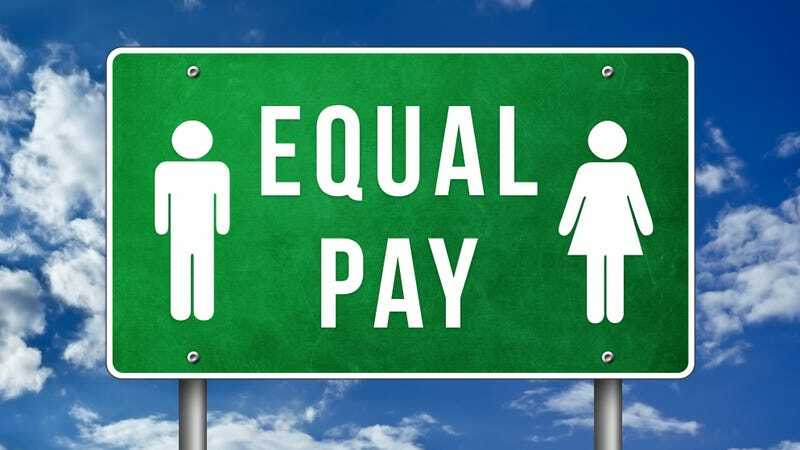 This Equal Pay Day, union president Gloria Middleton announced their win of a complaint filed in 2013, which contended that close to 1,600 of the city’s administrative managers—mostly women and minorities—were being paid less than their white, male counterparts. The Equal Employment Opportunity Commission (EEOC) agreed, and the city is now settling the claim. But in a more proactive move, New York City was one of the first to ban employers from asking about salary history (h/t HRDive), another crucial factor keeping women from advancing in the workplace. Knowing your state or city’s rules may help you better advocate for yourself, as well. Women aren’t generally encouraged to speak up for themselves, but potentially losing an estimated half a million to a million dollars in earnings over the course of a lifetime is nothing to remain silent about. While we don’t suggest storming into your boss’s office to demand a raise, negotiating never hurts—and carrying resentment over inequities may be more obvious and career-jeopardizing than you may think. Some work environments strictly prohibit speaking openly about your salary (gee, I wonder why? ), but there is a greater push for more transparency—and more reason than ever to find out whether you’re actually being paid what you’re worth, compared to your coworkers. If you’re not, at least be brave enough to ask why. In a 2017 Pew survey, 42% of women experienced discrimination in the workplace because of their gender. And the Economic Policy Institute points out that the effects of gender discrimination on women’s pay don’t just show up in employer’s pay-setting policies and practices. Women are often steered towards lower-paid careers, expected to balance the challenges of parenthood and work more fully than men, and guided to expect lower pay all along. All these factors can influence a woman’s career choice and path from the beginning, funnelling more women into lower-paid jobs and making them less likely to fight for equal wages once they get there. Is Equal Pay Day a day to celebrate? Absolutely not. It’s a day to educate, coordinate our resources, and advocate for ourselves and others. But whether you’re wearing red today, calculating your worth or having an honest conversation with your superiors about closing the pay gap, every little bit truly does count, for every single woman is still at the mercy of an unequal system.